The tour of Oliverland continues in this second installment of an exciting three part series. (Be sure to check out Oliverland Part 1, if you missed it.) 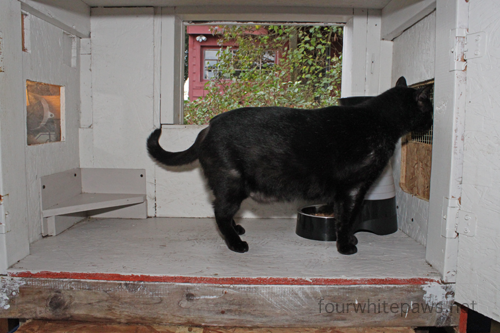 In todays tour, I'll show you Oliver's 24-hour feeder and lounge space. Before I get to far into the tour, let me detour into history and take you back in time to the very first Oliverland structure. This was back before I knew anything about anything. And it was before Oliver trusted me at all, back then he was too scared to share the yard with me and would run away when I came out. The very first building, was a combined dining space and living quarters. The outside entrance opened into the dining space and from there another doorway opened into the living area, featuring soft towel bedding. What in the world was I thinking?! How did I expect Oliver to live in such spartan conditions? no windows, no insulation, and no heat! Yikes! But that wasn't the only thing that needed to change. My TNR mentor at the time quickly set me straight. 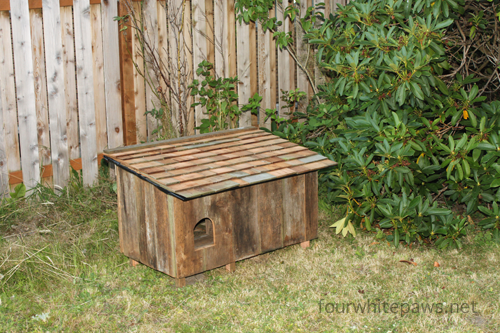 When building a cat shelter, you never want to put the food right near the living space as the food will draw predators and other potentially unfriendly visitors. 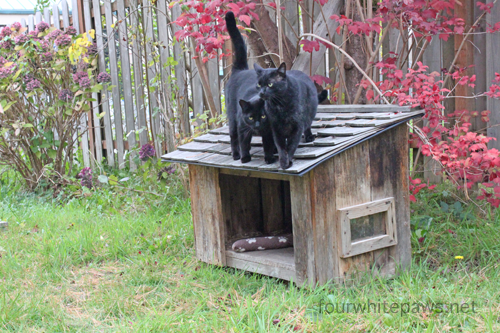 I also learned that a feral cat shelter should always have two doors, that way a predator can't corner the cat inside the shelter, it can escape out the backdoor. With this new knowledge in mind, I got busy constructing a standalone Dining Hall. The state-of-the-art Dining Hall featured two real-glass windows, a large picture window looking out back and a smaller window facing East. 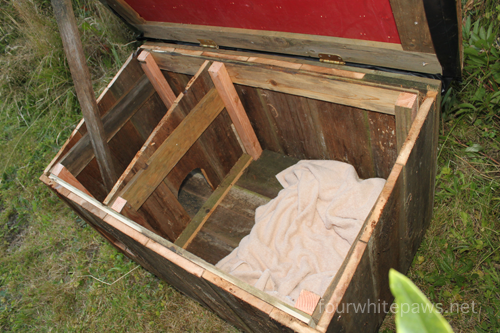 Inside, Oliver could eat and drink while staying dry from the rain! With the Dining Hall completed, I went to work on remodeling the living quarters. The old dark, cold living space was deconstructed and replaced with Oliver's Guest House, a modest sized insulated and heated home (which you saw on Part 1 of the Oliverland tour.) 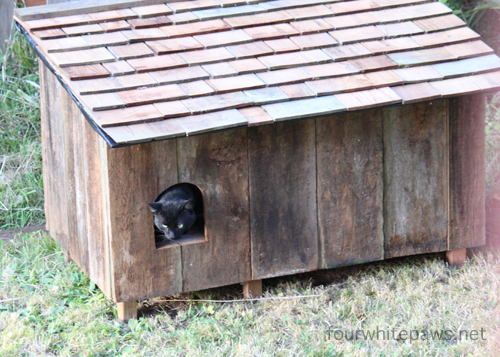 With Oliver immediately taking to his new digs, it became clear he needed a larger, more grande home for his greatness, and thus, Oliver's House was commissioned (again seen in Part 1 of the tour). When these renovations were completed, Oliverland consisted of the Dining Hall, Guest House, and Oliver's House - each of the living spaces were now upgraded with full insulation, heat, web-cams, and two doors. Oliver and his family were happy, and a happy Oliver meant happy Oliverland Management. But then the slugs came and swarmed the food bowls, grossifying everything. And not to mention the raccoons and opossums, which I was not interested in feeding. 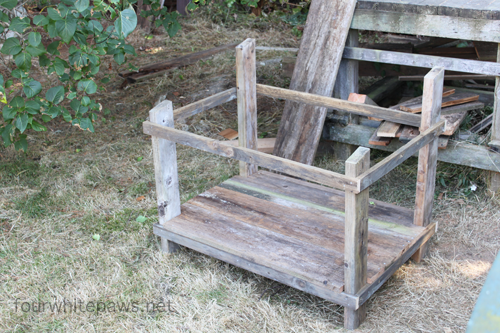 I had learned about raccoon-proof feral feeders and wanted to build something. I did some research and found the basic 4x4, platform design. But then I realized I could build something into the side of my detached garage. 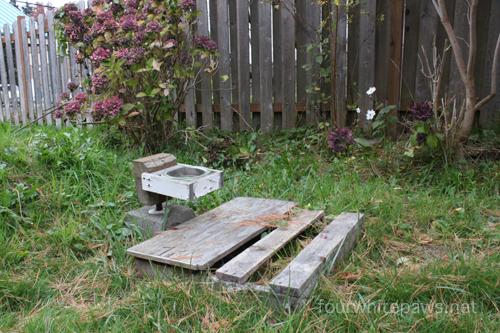 After a little work, Oliver had a new raccoon-proof (and slug-proof) feral feeder! 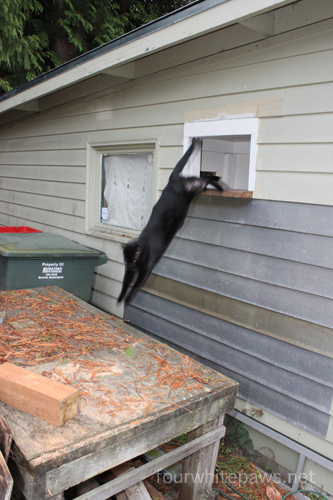 It's built on the simple idea that raccoons can't jump (they climb) but cats love to jump! 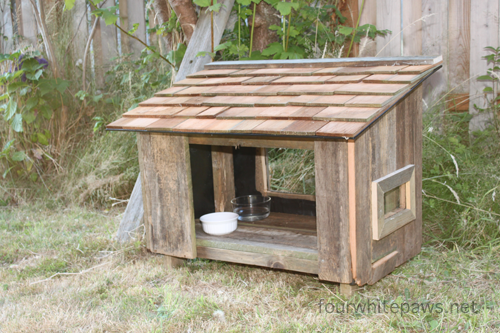 The metal flashing keeps raccoons from climbing up and the table gives the cats something to jump from, up to the feeder ledge. I've seen raccoons standing up on their hind legs on the table, looking into the feeder, not able to figure out how to get to the food! Success!! And no nasty slugs - I'm not really sure why the slugs haven't found it, but I'm not going to ask them. The feeder is basically a plywood cabinet built inside the garage, which I can access from inside, but the cats access from the outside. Back when I first built it, there was two corner shelves that had food and water bowls. 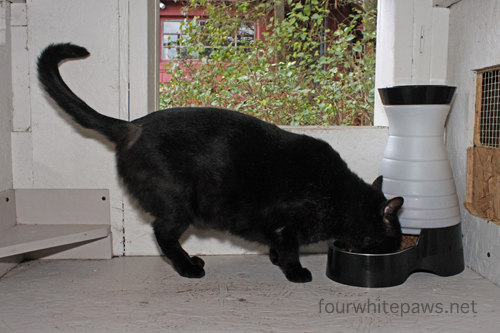 Now, I use a fancy gravity feeder with a stainless steel feeding bowl. It's the perfect size and is dishwasher safe! You'll notice what looks like a recent change on the wall to the right of the feeder (unpainted). That was a recent modification, that lets me attach a trap on a temporary shelf inside the garage, so if I want to trap cats who come to the feeder, I easily can. 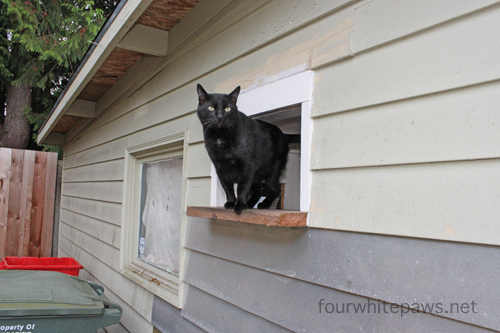 There are two windows in the feeder space, so the cats can look into my dark garage. Under the feeder is storage space for cat food. There's also a webcam in the feeder, so I can watch who's eating. Note: There is a limit to how many can watch the cam at the same time, so if everyone's tuning in at the same time, it may say it's unavailable. Also, newer internet browsers, like Edge, don't support the old software technology, so you may be out of luck. 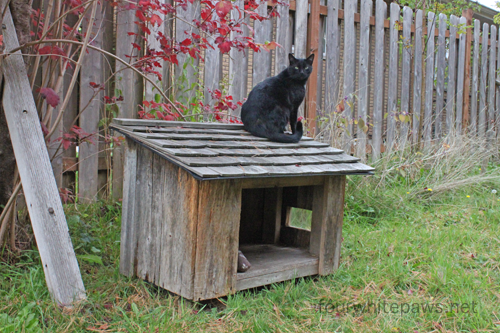 The feral-feeder provides Oliver, his family, and distinguished guests access to fresh food 24-hours per day, 365-days per year. They love the food, but are less keen about the water being so near the food in the feeder, so after years of the water going untouched, the controversial decision was made to remove it from the feeder and built a separate temporary watering station. As you can see, this temporary watering station is extremely crude and is not up to the high standards of Oliverland. Oliver, and family have filed many complaints with Oliverland management about having to drink water in the open air (at risk of getting drenched in bone chilling rain and wind), not to mention the dangerous condition of the platform (a kitty could hurt a leg if they stepped into one of those holes in the dark of night.) Due to the ongoing contentious negotiations and threats of bitey action from the kitty council, Oliverland management is unable to comment further on this matter at this time. Both management and the kitty council are all hoping a settlement will be reached soon and this matter will be behind us. Meanwhile, when Oliver's feral-feeder came into service, the old Dining Hall was fully renovated into a Lounge Hall - a place for Oliver and his guests to hangout away from the rain or blazing sun. In the remodel, the large picture window was removed so access could be from either side. The Lounge Hall is a popular spot for enjoying a visit with friends and family or having a go with the kickeroo. In the upcoming Part 3 of the Oliverland tour, you'll get an in-depth look at Oliver's back porch palace, his kitty castle, and loft - and maybe if we're lucky, the tense watering hole situation will be resolved with a new weather-proof watering hole arrangement (I've been hearing rumors about a possible kitty-gazebo!) Stay tuned!! I just love what you've done with Oliverland! Looks like Dodge City. Where's the saloon? This is sooooo Pawsum. Weez hate fur kitties to have to live outside, but ifin they have too, they shuld all be so lucky. Fanks fur takin' such good care of Oliver and hims furiends and furmily. We really enjoyed the tour too, lots! Oliver, family and friends are so lucky to have found such a talented and loving architect, builder and family. Can't wait to see the new water station. Oliverland is the best! you seriously have no idea how much I adore you.